Maxwell started preschool yesterday, he had a wonderful day and it was filled with lots of proud moments. Although it was not Maxwell's first time at preschool, it was his first time at his new big preschool and it was a huge achievement that he went and enjoyed himself. His day at preschool was a little bittersweet as he commented on the fact his "old friends" were not there to play with however he did mention he had made new friends to play with and he commented on the fact he was excited to see them again. Over the summer holidays, Maxwell saw a few of his friends that he made at his old preschool and enjoyed a few play dates with them. Due to the fact that some of Maxwell's friends were leaving preschool and moving on,Maxwell and I decided to host a back to school party. We decided that we would have a fun fancy dress party and have lots of nibbles to eat. Thank's to Asda we were sent some fun fancy dress costumes for the children to wear to the party and we were also able to get some delicious food thanks to Asda for us all to snack on. Asda have a wide range of costumes for children. From animal costumes to superhero costumes, ballet costumes to scary dragon costumes, there is something that will suit every child. Each costume that Asda sell is good quality, sized accordingly and great value for money. 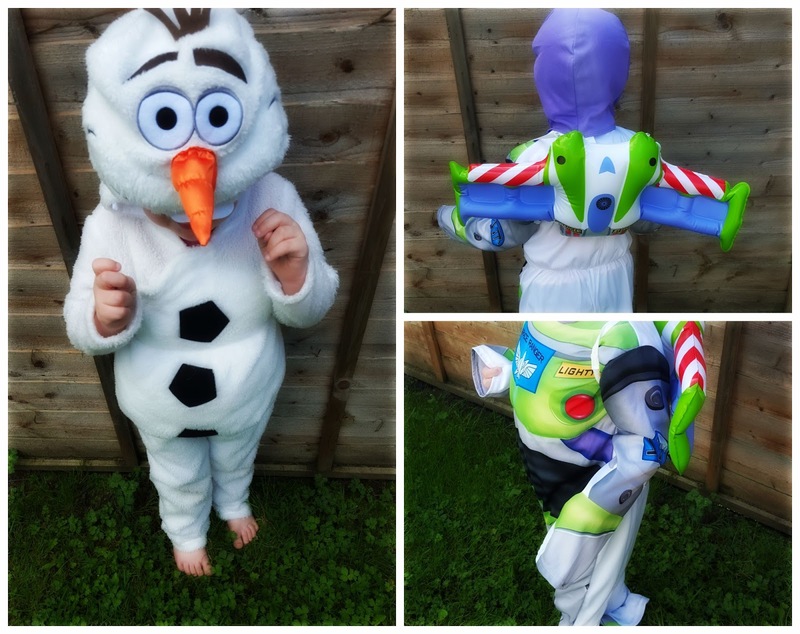 Due to the large selection of costumes that Asda offer, we did have a little trouble choosing the costumes for the party however after a lot of thought and taking on board what the children wanted to wear to the party, we choose a few costumes from Asda and awaited delivery of them. The delivery of the costumes was fast and easy. The costumes were packed well and were left with a neighbor who kindly took them in for us due to us being out when the delivery arrived. The costumes were packed neatly and inside the packaging we were sent a order returns letter incase we had a problem with one of the costumes. We had no issues with the costumes however it was nice to see that Asda offer a easy returns process if it is needed. Maxwell decided to dress up as Olaf from Frozen for the party. The film is one of his favorites and he is a big fan of Olaf. The costume was white, fluffy, a good fit on Maxwell and was priced well at just £10. The costume had some great detail added to it and I felt Maxwell looked the part in his costume. The costume fitted Maxwell like a onsie, included a fun snowman hood with a large orange nose and also included a large rounded tummy. I felt Maxwell stood out from the crowd in his costume. Max also had a few friends attend the party. One of our favourite costumes that Asda sent was worn by Max from Max and Mummy. Max wore a Captain America Costume. The costume had fantastic detail on it and again the costume was priced well at £12.50. 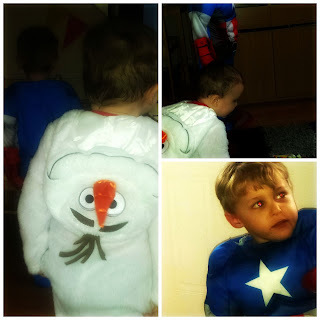 The costume came with a body suit which again fitted like a onsie, a hat that made sure Max fitted well into his captain America theme and the costume also came with a shield which the boys loved playing with at the party. The BFG, a mouse, a Transformer and Buzz from Toy Story also attended the party. At the party, we played a few fun games and also ate lots of delicious food. 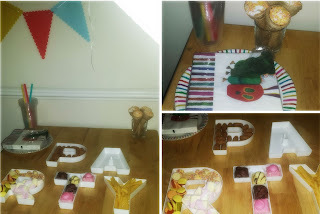 I decided to serve up traditional party food which went down well with not only the children but also the adults. I decided that I wanted the table to look bright and I also wanted to stick with a school theme. Due to this I decided to get Hungry Caterpillar accessories due to it being Maxwell's favourite book. I stuck with plain accessories to accompany the Hungry Caterpillar party table theme as I wanted to focus mainly on the Hungry Caterpillar theme and not a busy mismatched theme. We had a great time at the party, overall the party was a great success. 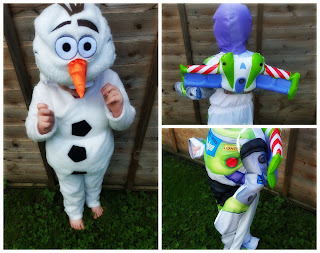 If you are on the lookout for fancy dress costumes for your children which can be purchased on a budget. Asda's extensive range is for you. The costumes are well made and made to withhold a little rough and tumble. The design on the costumes is ace and the accessories which match the costumes have been carefully made and well thought about. Asda offer arrange of costumes for boys and girls of all ages that will ensure that they stick out from the crowd at any fancy dress party. *We received a selection of costumes and a voucher for party food, in return for this post. All thoughts & opinions are my own. Oh my, Maxwell is so cute and the party sounds amazing :) Great fun! Aww these costumes are so cute! It's great that they were delivered quickly. Maxwell wanted to wear the Olaf costume today to go shopping. Asda's costumes are reasonably priced. Yes, fondant fancies ... we love them as a treat. Aww! How cute! It looks like you had a great time! We had a fab time Kim. Olaf is a firm favourite here. Oh this is so cute, I love the photos. That Olaf costume looks great! We had a fab time and Maxwell loves dressing up. It looks like they had a fun party :) i love fancy dress! Thank you. We all had a fab time. Aw what a fab reason to have a party, great idea! Such fun was had. .. Thank you. Oooh what a great party! Those costumers are sooo cute.